With Benteke causing a fuss about his contract and revoking his Holte End cult status by handing in a transfer request, Aston Villa Football Club was left with a dilemma. Manager Paul Lambert had begun pre-season training and had to deal with three friendlies in Germany – when would he have time to find a replacement for Benteke, if the Belgian left? Having seen the backlash of Newcastle United fans to the appointment of Joe Kinnear, as Newcastle’s ‘Director of Football‘, the Villa board decided they should take a different route to just signing a washed-up ‘football person’ to help with transfers. Villa CEO Paul Faulkner, always on the look out to exercise the principle of thrift, had heard there were some Villa transfer know-it-alls on Twitter. Having spent an afternoon scanning the social media portal, he concluded that these ITK (In The Know) accounts knew more about what was going on at Villa than he did. He came across three or four Villa transfers that he had no idea were taking place. This was the kind of ahead-of-the-curve fresh blood that the club needed in the Villa Park offices in B6. When mentioning his consideration of employing an ITK in a kind of Director of Football type role in a recent interview, Faulkner stated ITKs had a distinct advantage over people who actually work in the game, when it came to transfers. “For example, these ITK accounts even have an advantage over Paul [Lambert],” said Faulkner. “While Paul takes a nine months to complete a season, these guys ,who run these Twitter accounts, can complete whole seasons in a matter of a couple of days on Football Manager. Faulkner’s enthusiasm to get a ITK on board has been tempered by whispers that Paul Lambert is actually privately sponsored by both Youtube and Google; with his contracts with them forcing him to buy unknown players to drive traffic to both the online portals. With Villa supporters never hearing of any of the players he brings in, they completely rely on both Google and Youtube to find out any scraps they can about the mysterious signings. Surely Villa ITKs, who always, for example, throw up the name of Defoe every transfer window, would conflict with Lambert’s internet endorsement deals? Regardless of the issue, Faulkner soon found out that Villa chairman Randy Lerner was a big fan of ITKs and could potentially go for his idea. 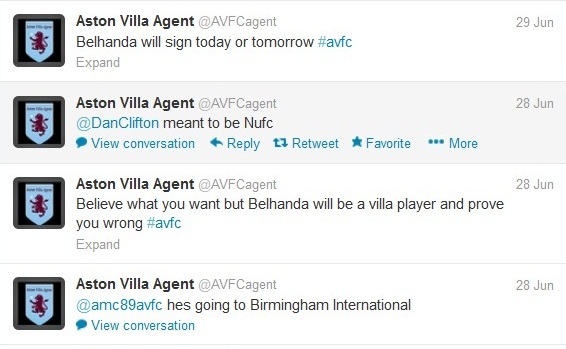 Having been away from Villa Park all summer, Lerner had been keeping up with the club’s affairs via Twitter. Lerner saw nothing wrong with the ITK’s logic of ‘Luke Murphy was an ex-Crewe college and friend of Ashley Westwood, so he must be joining Villa. A week or so later, according to the ITK, Murphy was a player who was off to Blackburn Rovers. Apparently, in the eyes of the ITK, Lambert had never thought about the possibility that Gary Gardner would actually be coming back from injury and was made to ‘reassess options’. If Lambert can’t keep track of Gardner’s fitness at Villa, what chance had he of keeping a ‘close eye on him [Murphy] at Blackburn’? Absolutely none, as Murphy actually signed for Leeds United. Lerner decided to give the ITKs another chance. After all, there were plenty of them about on Twitter, so maybe he had just been following a bad one. His next call to Faulkner was prompted by the American’s gleeful excitement that Villa had signed a world-beating Moroccan superstar called Younès Belhanda. A player, who admittedly, he’d never heard of before he saw him mentioned on Twitter. “Bell Ender?” replied Faulkner, not quite making out the player’s name. “Yes! Lets hope he’s better than that other Moroccan we signed,” continued an enthused chairman. After Faulkner told Lerner the deal wasn’t happening, at first, Lerner refused to believe him. After all, the ITK hadn’t given up on signing Belhanda and he had always considered Faulkner’s knowledge on the transfer of players as a bit iffy. It was only when Lambert himself put Lerner in his place, that the penny finally dropped for the Villa chairman. “Git to f**k! Shouted Lambert to his chairman. It wasn’t happening. Belhanda signing for Dynamo Kiev also had something to do with changing his mind. By the time the ITKs had moved onto signing up Hiroshi Kiyotake for Villa, Lerner had realised the error of his ways. He did take heart though in reading a MOMS retweet that there had been a Mexican stand off on Twitter over Belhanda, resulting in one less ITK in existence. The one that had actually led him up the garden path with the player. After all, anybody can knock up a wikipedia page and post up some phoney Youtube video. Both Lerner and Faulkner decided they had learned another valuable lesson in attempting to cut corners (almost as valuable as the one they learnt from giving McLeish a job). The sad truth of giving one of these ITKs a job as Director of Football at Villa was, it would put them in danger of making even Joe Kinnear look good. *A Venglos View is a satirical (and sometimes surreal) look at Villa.